HIP TEACHER’S GUIDES save teacher time and support student comprehension. A unique Teacher’s Guide accompanies each HIP novel. The Teacher’s Guides are available for purchase individually, but FREE with any order of 6 or more copies of the same title. All HIP Teacher’s Guides are developed by international literacy expert and former International Reading Association board member Lori Jamison. These guides provide support for pre-reading, higher-level discussion, comprehension during reading, and meaningful after-reading activities. Where available, print Teacher’s Guides will be sent along with the book order. Some guides are only available in PDF format and these links will be sent via email. Note that the HIP FANTASY SKINWALKERS and DRAGONSPEAKER Packs have one Teacher’s Guide for all three novels in the Library Pack. 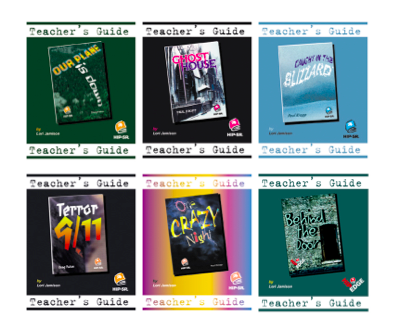 HIP Teacher’s Guides are intended to support teachers in using HIP novels for small group instruction, literature circle discussions or independent reading. Based on research of what we know about effective reading instruction, the guides offer: pre-reading activities to build background knowledge and generate interest in the novel; during-reading discussion points to stimulate higher level thinking; and graphic organizers and other response activities to build comprehension and retention. Each HIP Teacher’s Guide chunks the novel into three or four logical sections, with discussion points and graphic organizers. Students can complete the reading on their own, then join a teacher- or student-led discussion group or complete the organizer independently. After reading, there are several creative thinking options to extend and enrich experience with the novel. Some teacher’s guides also provide written questions and an end-of-novel quiz. They offer a smorgasbord of activities from which to choose, or a complete novel study unit. Special Teacher’s Guides for the HIP FANTASY titles – Skinwalkers and Dragon Speaker – cover the three titles for each series in a single guide. The BATS Mystery Series offers individual Teacher’s Guides for each of the novels as well as an “omnibus” Teacher’s Guide for the entire set. Download a sample Teacher’s Guide for Shooting the Rapids.